* Fashionable and functional, the Femme Fatale Croco Tote has is all! 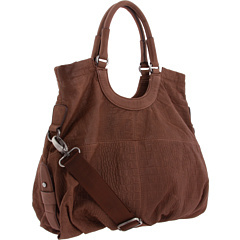 * Tote-style shoulder bag made of crocodile-embossed leather. * Holds your wallet, sunglasses, a copy of your favorite book and water bottle. * Dual handles. Handle drop: 8″ length. * Detachable, adjustable shoulder strap. Maximum drop: 30″ length. * Rear exterior zip pocket. * Lined interior feature a back wall zip pocket and front wall slip pockets. * Dimensions: 16″ wide x 4 1/2″ deep x 10 1/2″ high. Always on the forefront of fashion, BCBGMAXAZRIA is taking the world by storm. With critically-acclaimed, award-winning collections, a loyal following of Hollywood’s top celebrities has developed, evolving BCBG into one of the hottest names in the fashion industry today. Named for the Parisian phrase “bon chic, bon genre”, which means “good style, good attitude“, the brand embodies a confident blend of European sophistication and American spirit, with an enduring mix of on-trend pieces and timeless designs that ensures everyday, effortless chic.